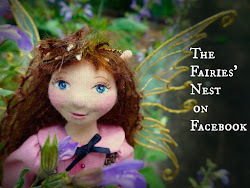 The Fairies Nest - OOAK Cloth Dolls & Fiber Fantasies: Jam Today! Despite what the White Queen says about jam in Alice Through the Looking Glass, " The rule is jam tomorrow and jam yesterday, but never jam today", you can see that indeed it is jam today here at The Nest. Strawberry jam and Strawberry-Orange marmalade to be exact. I used my brother David's recipe for the jam and just winged it for the marmalade and they both came out delicious. I love to see those jars of preserved fruits and veggies start filling my pantry shelves ...it both satisfies my nesting instincts and warms that thrifty part of my soul. These are the first of this growing season but I hope that the weeks to come will bring pickles, tomato sauces, herb vinegars, and of course more jam! Here's a little garden pixie ready with her watering can. I know I'll spend plenty of time lugging mine from the rain barrels to the garden eventually but for now we've been getting plenty of rain so that's still mostly in my future. Happy Strawberry days to all of you!! You made my mouth water with all that jam! Man that looks yummy! And your little sweet fairy at the end is precious! I love the colour of the jam. What a beautiful shade of red. 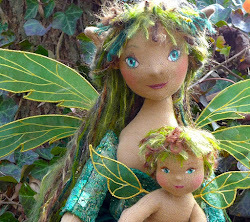 I love the fabric of the tiny garden fairy's dress. where do you find those itty bitty watering cans?? David's blackberry jam is one of my favorites, but I don't know, Strawberry-Orange marmalade sounds pretty darn good (she said longingly)! 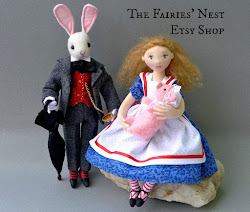 We were just listening to Alice on CD the other day - Bitty B was most amused! I want to do more...hoping to get a pressure cooker so I can can veggies and stuff. Mmmm, delicious. Jam and toast with a cup of tea sounds divine right about now. Love your fairies! Blessings.